GF/DF Chocolate Chip Caramel Brownies! Just saying that makes my mouth water.These are quite possibly some of the most luscious, decadent brownies I have ever tasted. A blondie chocolate chip brownie base cooks alone and is then smothered with a Creamy Homemade Caramel Sauce and finally topped with chocolate chips and nuts. (The nuts, of course, are totally optional especially since many of you have an allergy to certain or all nuts.) 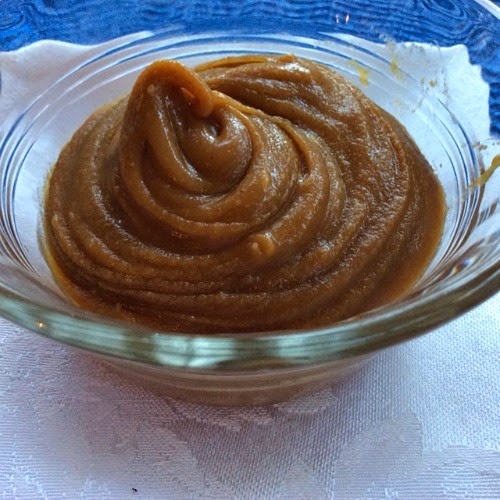 The Homemade Caramel Sauce is made with just a few ingredients and takes only minutes to make. It just could not get any easier and it tastes so good! 1 cup chocolate chips: Note: Enjoylife brand is gluten, soy and dairy free. Lightly grease an 8-x-8-inch square baking pan with a little coconut oil and set aside. In a medium saucepan, melt the coconut oil. Add the brown sugar and heat, stirring, until the sugar is dissolved. Set aside to cool for 10 minutes. Beat in the egg and vanilla. Add the applesauce to the wet ingredients. In a small bowl, combine the brown rice flour, baking powder, and salt. Stir the flour mixture into the wet mixture. Fold in chocolate chips. Pour the batter into the prepared pan and bake for 25 to 33 minutes, until brownies are set and light golden brown. Cool, top with the Caramel Sauce, additional chocolate chips and pecan halves. Cut into bars. Put the sugar into a sauce pan. Cover the sugar in the pan with the water. Cook the sugar and water over medium heat. When it starts to bubble, keep a close eye on it. This takes about 10 minutes. When it turns a dark golden amber color pour in the coconut milk and add the vanilla and sea salt. It will bubble like crazy. Just keep whisking and and the sauce will all come together. Allow the caramel to cool to room temperature. It will thicken up as it sits. Keep any extra in the fridge. Yummy! that looks really tasty! Love brownies, especially without any additions, but those brownies looks so good! Looks incredible. 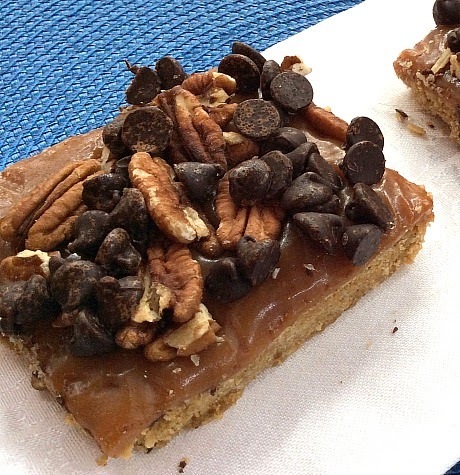 Thank you for sharing with Gluten Free and DIY Tuesdays!! Would this work with an egg substitute - I'm allergic to eggs. Yes, egg replacer should work just fine with this recipe. Thanks for visiting! Where does the applesauce go. I just tried making this and it came out not liquidity before I could even put it into the oven. The applesauce should be added in step 4. If your batter is still too dry you can add an additional egg. Hope that helps!